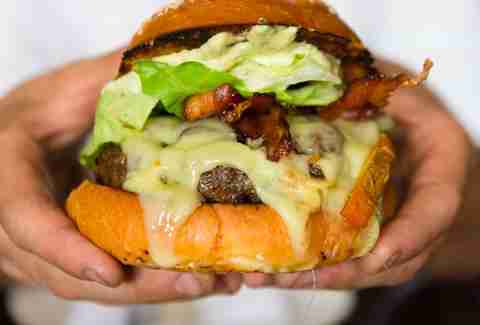 One of the 33 best burgers in America, the LBB is one of the few things that survived La Bete's transformation into a playful cowboy-themed eatery, and the Painted Hills beef is still topped with the Gruyère, grilled onions, remoulade, and of course, bacon. No longer just what that weird guy in your building keeps calling your girlfriend, these hot cakes are made-from-scratch waffles on a stick stuffed with glorious ingredients and served from a bright orange food cart that's famous for it's Red Velvet Buttermilk version. But this article isn't about red velvet cake, is it?! 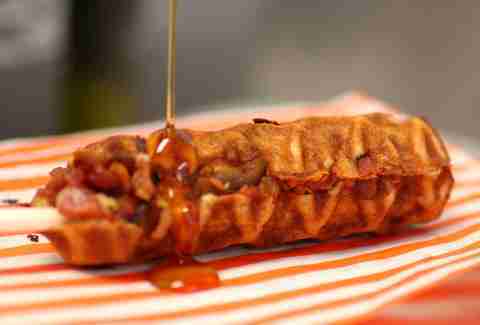 No, so you'd better settle for this one that's made with beer and covered in syrup. Just like its name suggests, this pie makes use of the entire hog. 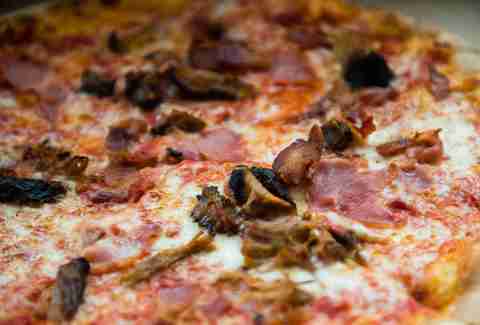 From bacon and pulled pork to prosciutto, it's the perfect pizza to... sorry'boutthis!... pig out on. 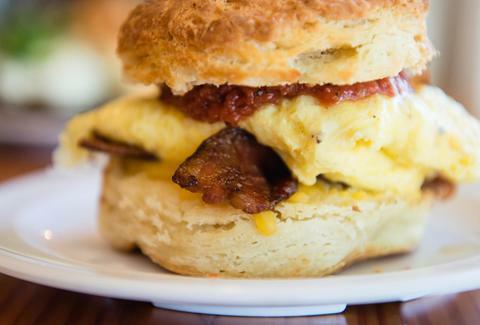 Make a fast break for breakfast at Morsel with its Fast Break, which has two hefty slices of bacon, egg, cheddar, and roasted tomato jam. 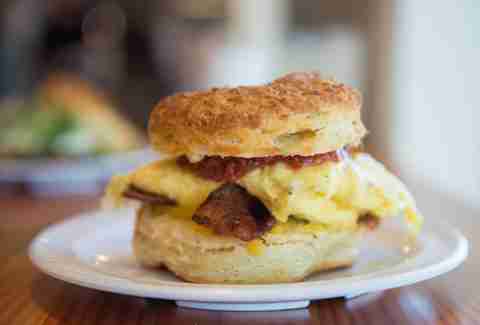 This meaty biscuit can be found at Morsel’s location in the U-District or Ballard. 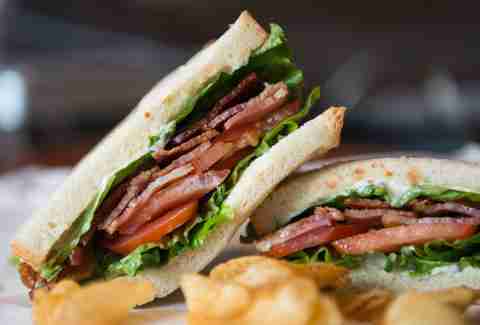 The king of all bacon sandwiches, Delicatus’ B.L.F-ingT trumps all other BLTs. Chock-full of the essentials: bacon, leaf lettuce, tomatoes, and mayo on sourdough, Delicatus recommends that you consult your doctor before ordering. Message received! The early bird gets the worm, right? 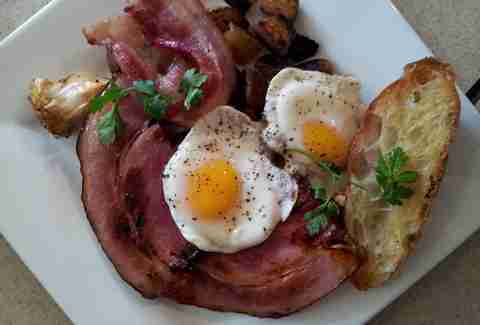 The Butcher and the Baker serves brunch on Saturdays and Sundays from 9am-2pm, and on its brunch menu you’ll find this hearty meal complete with two eggs, winter vegetable hash, fresh fruit, and your choice of bacon or ham. A super-savory treat that never fails to hit the spot: Asiago-stuffed dates wrapped in bacon. If you don’t think you need this in your life, then you don’t know what you want. This famously jam-packed appetizer will leave you feeling devilishly satisfied.